Gandhinagar : Union Minister of New and Renewable Energy, Piyush Goyal, on Wednesday said that the Indian Government empathise with the African continent. India understands the problems that the continent faces because they sync with our problems too. It is a matter of joint cooperation, partnership and development to help Africa in the best possible way to overcome the challenges of hunger, poverty, women empowerment, agriculture, he added. 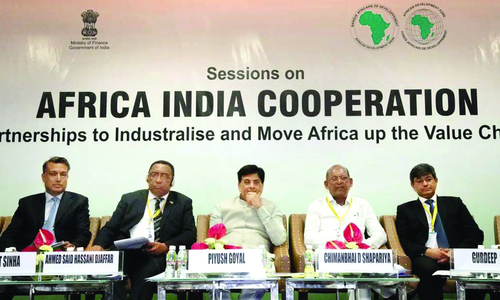 Piyush Goyal was addressing the session on Africa-India Cooperation on Powering Africa – Strengthening ISA and Africa –India Renewable Energy Partnership. The session was organised as a part of the ongoing Annual Meetings 2017 of the African Development Bank (AfDB) Group, at Mahatma Mandir, Gandhinagar. Goyal, elaborating on the India Africa cooperation, said that the Ministry of Finance, Government of India has already earmarked the $2 billion out of the total $10 billion aid that has been granted to Africa. He further added that Government of India aims to provide skill development and training to people from African in various sectors and promote exchange programmes to university like Pandit Deendayal Upadhyay Petroleum University (PDPU, Gandhinagar). ‘The PM aims to make every village of India electrified by 2022, which is the 75th year of India’s Independence’, Goyal added, eulogize the vision of the Narendra Modi. Government of India aims to provide the electricity to the most remote areas and to each and every household under the Pandit Deendayal Upadhyay Gram Jyoti Yojna. Goyal also launched the ‘Third International Solar Alliance Programme- Scaling up Minigrids and Microgrids’ at the session. The ISA initiative was launched at the UN Climate change conference in Paris on November 30, 2015 by Narendra Modi and President Francois Hollande. The ISA has been conceived as a coalition of solar resource rich countries to address their special energy needs and will provide a platform to collaborate on addressing identified gaps through a common agreed approach. Bhanu Pratap Yadav, Joint Secretary, Ministry of New and Renewable Energy said that India’s initiative led to the creation of ISA. Already 15 African countries have joined and the Government of India is encouraging more and more African countries to join ISA. Outlining the energy scenario in India, he remarked that by 2030 India aims to reduce emissions by 30 to 35 percent. He further added that today India has expertise and capacity in the renewable energy sector and can provide consultancy for renewable power projects.